From Victoria Falls, either take a 2 hour and 30 minute road transfer or choose a 45 minute light aircraft charter to Hwange Airport. Zimbabwe is a year-round destination, as it boasts a good climate throughout the year. The summer months (Mid November to March) tends to be quite hot with cool nights and the highest rainfall of the year. The best time to come would be the cooler months (April to early November) as these months have warm days, clear skies but cooler nights, thus warm clothing is required. The cooler months in Hwange are known to provide the best game viewing, as the bush is thinner and the animals all congregate at the waterholes to drink. Elephants Eye, Hwange is situated 13 km from the entrance to Hwange National Park on a private concession of 6000 acre. Hwange National Park is the largest park in Zimbabwe, covering an area of approximately 14 650 square kilometres and within close proximity to Victoria Falls. The lodge is an eco-style lodge offering a unique barefoot luxury experience. The concession has three waterholes which are frequently visited by game such as giraffe, buffalo, leopard, lion, plains game and many bird species. Hwange boasts an incredible biodiversity of flora and fauna, and a plethora of African wildlife. There are over 100 species of mammals and nearly 400 bird species recorded in Hwange National Park. The elephant population in Hwange is world famous, as it is one of the largest in the world. 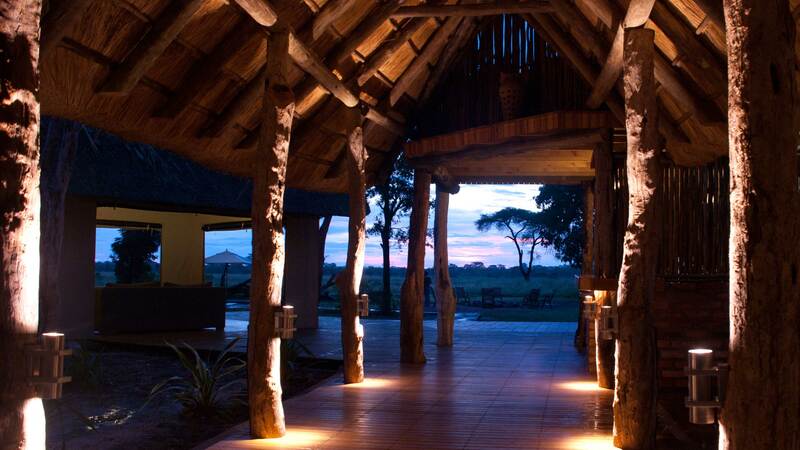 Travellers can enjoy the beautiful setting looking onto a waterhole which is frequented by elephants and other game. The camp has eight luxury tented chalets that over look the waterhole. Each chalet has a double or twin bed, which are surrounded by mosquito netting, with an en-suite bathroom with a bath and an outside shower. Other room amenities includes a fireplace, tea and coffee making facilities, safe and a fan. 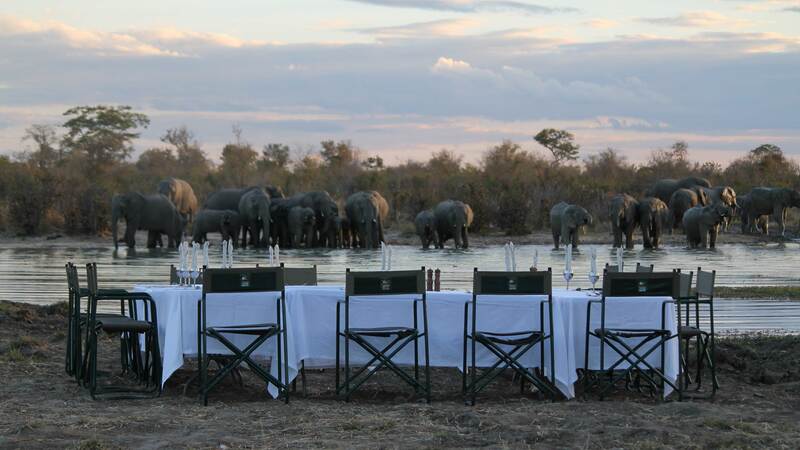 The Elephants Eye, Hwange can host a maximum of 16 people at any given time and all meals and most drinks are included. At Elephant’s Eye, Hwange, enjoy some outdoor dining. Meals are impeccably laid out and delicious, sitting on a blanket under African stars makes it all the more special. Elephant’s Eye, Hwange has a restaurant serving breakfast, lunch, and dinner. Room service (during limited hours) is also available. All meals are prepared and presented by the friendly team at Elephant’s Eye, Hwange. Elephant’s Eye, Hwange focus mainly on 4WD game drives. Guests can take two game drives per day (morning and late-afternoon) on the lodge’s private concession, or do a full-day game drive into Hwange National Park. For an additional fee, the camp can also organise walking safaris. Other options include a trip to a local homestead, and a visit to the Painted Dog Conservation Centre. 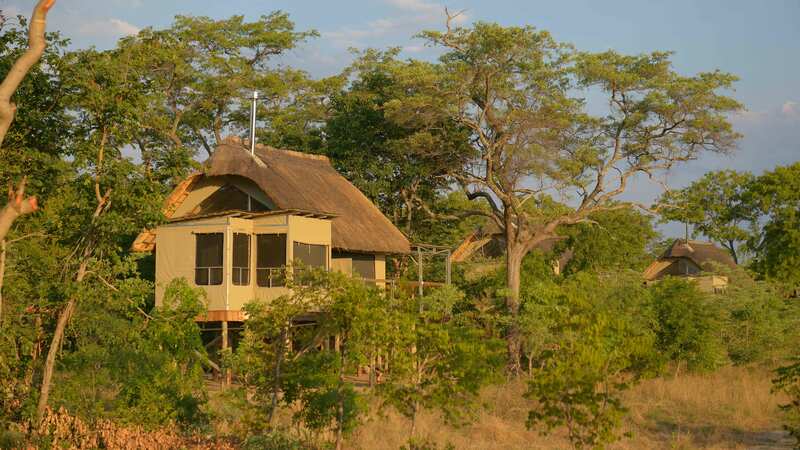 Very well priced for an exceptional experience in Hwange.